Vermont does its best to own maple syrup — the state tree is the sugar maple, and our neighbors even went so far as to designate maple as their state flavor. If you’re wondering if New Hampshire has a state flavor, we don’t. We have a state fruit (pumpkin) and state drink (apple cider) but no flavor. Vermont, by the way, has three state rocks — marble, slate and granite. Considering that we’re the Granite State, then we say we can lay claim to maple as our official flavor. Someone get the Statehouse on the job. New Hampshire has plenty of opportunities to taste and buy local maple syrup, and now is the perfect time to explore the world of all things maple. March is the New Hampshire Maple Producers Association’s Maple Sugaring Month, which includes the 24th Annual NH Maple Weekend (March 23-24). Sugar houses around the state will open their doors to the public, sharing information on the centuries-old tradition of making maple syrup. And, of course, there will be plenty of sweet treats, from sugar-on-snow to maple candy. The weekend also includes other fun things to do, such as horse-drawn sleigh rides, pancake breakfasts and more. A great place to begin your maple adventure is the Heritage Farm Pancake House in Sanbornton (pictured here). Start off your day of learning with one of the best breakfasts around. Order up a stack, pour on the syrup that’s made right on-site and dig in. As an added bonus, they use farm-fresh eggs, homegrown potatoes for the home fries, and bacon from Canterbury’s Fox Country Smoke House. After you’re full of pancakes and syrup, see how they make the tasty golden stuff with a tour of their sugarhouse. The tour also includes a tractor ride, tree-tapping, tasting and maple candy-making. 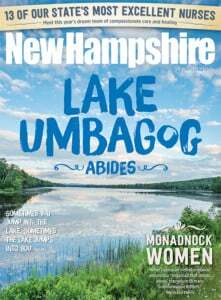 There are many other great events happening all around the state (visit nhmapleproducers.com to find one near you), but here are a few recommendations. The Rocks in Bethlehem, a lovely historic estate, hosts the New Hampshire Maple Experience (March 16, 23-24, 30-31 and April 6), where you can learn how to identify sugar maple trees, get hands-on practice with tapping and collecting syrup, and see the process of turning sap into syrup up-close. Plus, there will be lots of pancakes and syrup. This is just a sampling of what’s happening this month. Click here for more events and pancake houses. At Charmingfare Farm in Candia, hop aboard the horse-drawn Maple Express (March 9-10, 16-17, 23-24 and 30-31). The 20-minute trip takes you to a sugar shack where you’ll learn about all things maple syrup. After, enjoy pancakes with freshly made syrup. It isn’t just sugarhouses and farms that get in on the Maple Month fun. The Mt. Kearsarge Indian Museum in Warner devotes their grounds to the sweet stuff during NH Maple Weekend. Each day is packed with demonstrations and events, plus you can enjoy complimentary tastings of their maple syrup, Indian griddle cakes and sugar-on-snow. This is also a fun opportunity to learn about boiling sap the traditional Native American way. In Laconia, Prescott Farm’s Tap Into Maple days (Saturdays, March 2-30) provide hands-on participation in every step of the syrup-making process. Environmental educators are also on hand to help you build your tree identification skills.